An analysis of medical data from nearly 6 million Danes also found that in most cases, random chance may dictate which disorder people with co-occurring illnesses will develop first. Using the robust medical data available in Danish health registries, a team of researchers has developed the most comprehensive map of psychiatric comorbidity (the occurrence of more than one mental illness in an individual) to date. The notion that a patient can have multiple mental illnesses is not new. Research has shown that similar disorders such as depression and anxiety often co-occur, due to both genetic and environmental factors. However, this new study, published January 16 in JAMA Psychiatry, has taken this knowledge to the next level. The researchers found that psychiatric comorbidity is more widespread than previously appreciated and is not restricted to closely related psychiatric disorders. 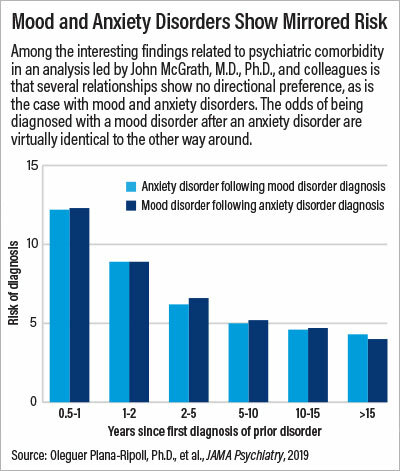 In addition, the study found psychiatric comorbidity is often bidirectional; for example, the risk of being diagnosed with major depression after an anxiety disorder is about the same as the risk of being diagnosed with an anxiety disorder after being diagnosed with depression.